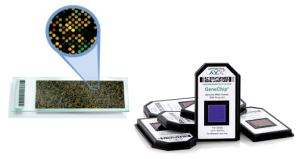 Expression Microarrays (or chips) are used to measure expression levels of large numbers of genes, microRNAs or ncRNAs simultaneously. Each spot contains picomoles (10−12 moles) of a specific probe which targets a certain cDNA under high-stringency conditions. Probe-target hybridization is usually detected and quantified by detection of fluorophore-, silver-, or chemiluminescence-labeled targets to determine relative abundance of nucleic acid sequences in the target. NXT-Dx offers gene expression arrays both from Agilent, Affymetrix and Illumina. Please contact us for more information on these or other arrays.